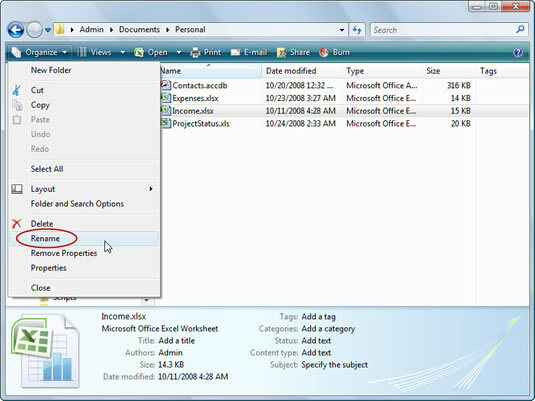 You can rename any file or folder on your PC. You can rename a file or folder to make it more descriptive, or to give it a name that’s easier for you to find. You’ll see that it’s selected. 2Choose the Rename command from the Organize button’s menu. 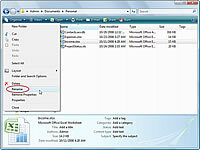 The file’s current name is highlighted or selected — just like selected text in a word processor. 3Type a new name or edit the current name. The new name appears as you type. 4Press the Enter key to lock in the new name. Note that all files must have a name. If you don’t give the file a name (you try to leave it blank), Windows complains. You can also press F2 to rename a file, after you’ve clicked it.